Edited by Airshack, Tue Feb 26, 2019 3:11 PM. Sounds like you have a marginal component somewhere on your motherboard that fails when it gets hot (which is pretty common). To find the culprit I would suggest using freeze spray in isolated areas of the board until the problem goes away. Then you can "hone" in further to find the faulty part. I would suggest starting with the RAM as that looks to be the most likely cause of failure. I would suggest starting with the RAM as that looks to be the most likely cause of failure. Wondering if the RAM gets appreciably warmer to the touch? I don’t see any capacitor leaks but may wish to re-cap in the future. Any good sources you recommend? How about RAM? I hear Apple RAM in //e and //c models was garbage and should be replaced. True? I would dispute this due to all my Apple's having their original RAM - with the exception of my 1981 Apple II+ which had one bad DRAM chip. In fact of all the vintage machines I own, the Apple II's are generally the best built and need the least repairs. Do you have a RAM expansion card or a RAM/80-column combination card in there? If so, what happens if you run the machine without it for a while? My IIe Enhanced did this in between powerups if I didn't wait between 20-30 seconds on many occasions. I'm not sure what causes it. The built in diagnostic never found an issue and I tested the DRAMs out of circuit too. The user manual also states to wait at least 30 seconds before powering back up ( page 41 ) so this could be normal. My theory is the DRAMs may still contain some data after a cold reboot which crashes the machine when it's powered back on, so allow 20-30 seconds. So if it is only happening from an immediate reboot and they say to wait 20-30 seconds, my guess is you need the capacitors time to discharge any remaining power that is keeping info stored in the ram. This is even an issue with electonics to this day. Just doing a reboot when you have something in the ram causing issues, you can still boot having issues. You are supposed to power down/unplug your computer, modem, etc. and count to 30 then plug the device back in. If you power it down to reboot it, then definitely give it time to discharge first. But typically you reboot with ctrl-open apple-reset, which in all my years of playing with the school's computers has never led to a weird state like that. Well, I'll amend that. 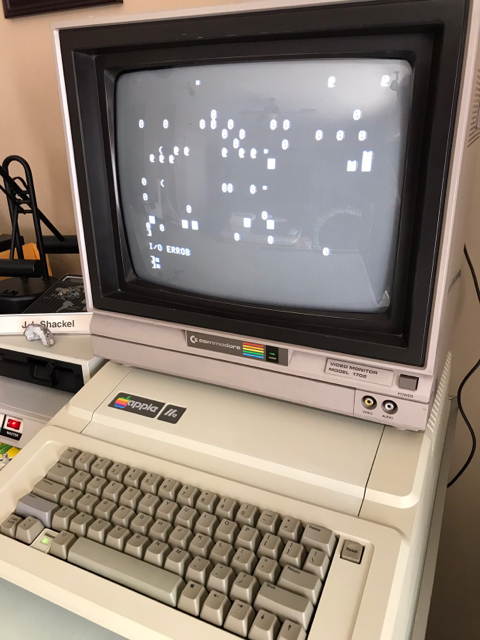 When first hitting the reset key, the screen would sometimes fill with garbage for a second, maybe, before the beep and the disk drive activation. But it would clear up immediately. I used them quite extensively in school too and I can't recall ever seeing it. The later Apple IIes seem to be a bit flaky nowadays. Apple used the cheaper single wipe sockets in those and they can be quite troublesome with the metal tabs inside losing their springiness. I do recall my machine booting to junk after moving it from one side of the room to another so I put it down to that after a re-seat of the main chips fixed it. If I end up getting another 2e enhanced then it's going to get a set of high quality dual wipe sockets. On machines this old, a cleaning of the IC sockets and pins with Deoxit is in order. Consider it standard required maintenance. And yep, many //e models had crappy Micron ram in them. So no surprise if they're bad. And yes again, it's best to power them down for about 10-20 seconds between reboots. Personally I've never had to really go beyond 10 to get a clean reliable start. The later Apple //e Platinum model is likely the most reliable of all. The early //e units with the 8 ram chips at the bottom are among the worst. Edited by Keatah, Wed Mar 20, 2019 2:04 AM. That's interesting but it makes sense, the more chips then more that can potentially can go wrong. But I like how nice and clean the early Apple IIs look inside, it's like a work of art the way Woz laid out the components. He took a lot of pride in his designs. I've had to go beyond 20 seconds on some occasions to get a clean cold boot. I'm not sure why this happens, does the boot up sequence in the rom not include a routine to clear the main and aux mem ? Edited by shoestring, Wed Mar 20, 2019 3:55 AM.